6.00mm diameter to 65.00mm diameter. 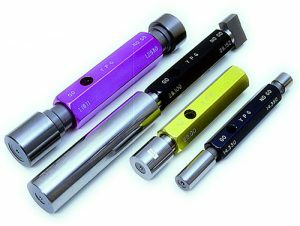 Taper-Lock gauges are used for conventional hole diameter inspection as well as the gauge base for additional features such as hexagonal holes, holes requiring a recess in the leading face of the gauge, square and rectangular gauges and large diameter concentricity gauges. Gauge Members are securely held by a taper in a black hexagonal handle marked with the Go and No Go dimensions.